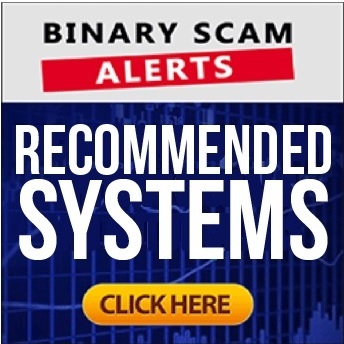 Binary Scam Alerts » Bitcoin Scam Reviews » Bitcoin Code Review, How Does The Scam Work? 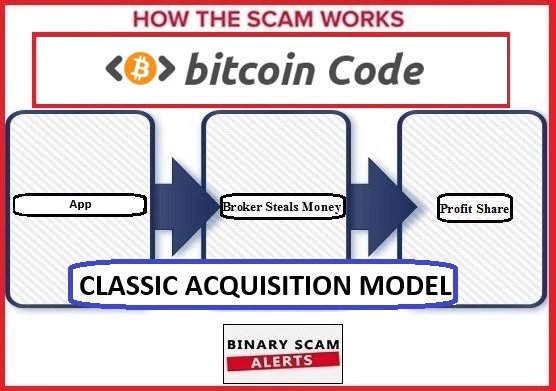 The Bitcoin Code fake automated trading software by Steve McKay is quickly turning into this summer’s hottest, most notorious, and sneaky SCAMS which our staff has already blacklisted in our previous review and investigation. 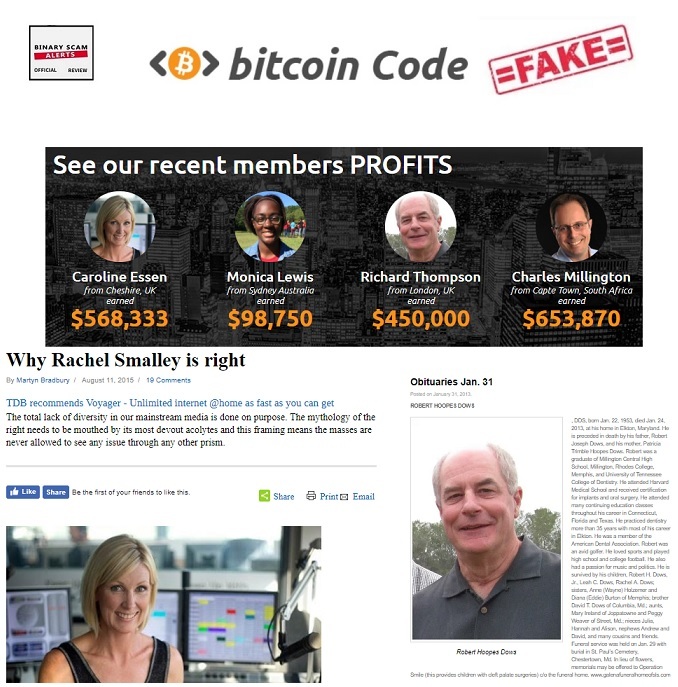 Make no mistake, if you have searched the internet about the Bitcoin Code get-rich-quick scheme then you are being targeted by some of the internet’s most dangerous and professional con-artists. We have previously warned our members and subscribers in regards to this most recent fraudulent trading app, but it seems the lure of easy money in the form of anonymous cryptocurrencies is just too hard to pass by, and the results are very grim to say the least. We have received a deluge of complaints in regard to BTC code, and frankly we are not surprised. Crafty online promoters are riding the Bitcoin wave prompted by the latest string of news stories and are using it as the proverbial fig leaf to hide their true intentions. Similar examples are BTC Robot, Crypto Robot 365, and most recently Bitcoin Millionaire are viral scams which are being rolled out and promoted by clever affiliate marketers looking to piggyback on the BTC price index and the many success stories that are being publicized. This unique followup review will focus on Bitcoin Code, and try to explain how the scam works, who is pulling the strings behind the scenes, and why it is so deceptive and misleading. Keep reading to see how we have exposed these crooks and why we believe this phony auto trader is so dangerous. Additional Proof of Deception – More Fake Testimonials! When we started digging in deeper we found even more disturbing facts. If you take a look at the “Live Accounts” section on the sales page, you will see they are all images that have been stolen from the internet without consent. For example, “Rita Torry” is actually Christine Houk, and Lou Richardson is someone named James Rosen. As if you needed additional evidence, Richard Thompson is actually Robert Hoopes Dows who has recently passed away (nice touch). But these guys went too far and actually ripped off a picture of Rachel Smalley, who is a syndicated TV news presenter residing in New Zealand. We have contacted her and are waiting for a response. We believe she will not be happy about her picture being used to peddle fraudulent software online (to say the least). The performance section of the sales page is a Java Script widget which follows certain criteria and will show almost always winning trades. We have deciphered the code and understand how it is programmed so don’t believe the ITM ratio and always remember that the only results that matter originate from the broker’s trading history section and not some bogus feed. The diagram below illustrates the process and how the money is stolen. The online promoters sell the fake software and then the broker steals the money. After the broker has finished they share the loot and move on to the next victim until the effect of the scheme fizzles out. When you deposit money it does not go directly to the broker. The broker has a deal with a processing company which is licensed by Visa or Master Card to accept transactions. That money stays with the processor for a period of about 90 days (this can vary) and after that it is wired to the broker less the agreed upon fees. This is how every business operates, with one difference. Rogue brokers have been known to over charge credit cards, and that is where the trouble begins. They do so for a variety of reasons, first and foremost to cover hefty advertising and operational fees. Only after the cover those fees do they start seeing the profits. So if you invest the minimum amount (which is what most traders do), you are in the highest risk bracket since the crooks only cover their costs after about $1,500 in deposits and that is a hefty sum which can potentially wreck a home and a family. Bitcoin Code Software Review Recap – $550 an Hour? Steve McKay is offering you a life-changing opportunity and join his beta-testing team, the same team that made $13,837 during the last 24 hours only. Now it’s your chance to get in on the action, but you have to be an action-take not a tire-kicker. McKay was supposedly a Wall Street trader who made it big and diversified into binary options and automated trading. Now he is self-made and wants to share some of the secrets with people who are ready to take action and invest. The price index is now showing that 1 BTC = $3,999.04. It means that 1 Bitcoin is valued at around $4,000. This is an all time high and it doesn’t look like its going to regress towards the average any time soon. Real investing would require a BTC wallet and for you to purchase or sell Bitcoin, Etherium, Ripple, and Litecoin. If you are just asked to fund a trading account with your credit card and trade fake stocks on rigged software (as opposed to a real exchange) then you had best hightail it before you get cheated out of your money. If you are hesitant and not quite sure about how to proceed this is perfectly normal. Our staff of diligent researchers has compiled a short list of the most reputable and consistent money-making apps. These are all proudly showcased in our recommended section. 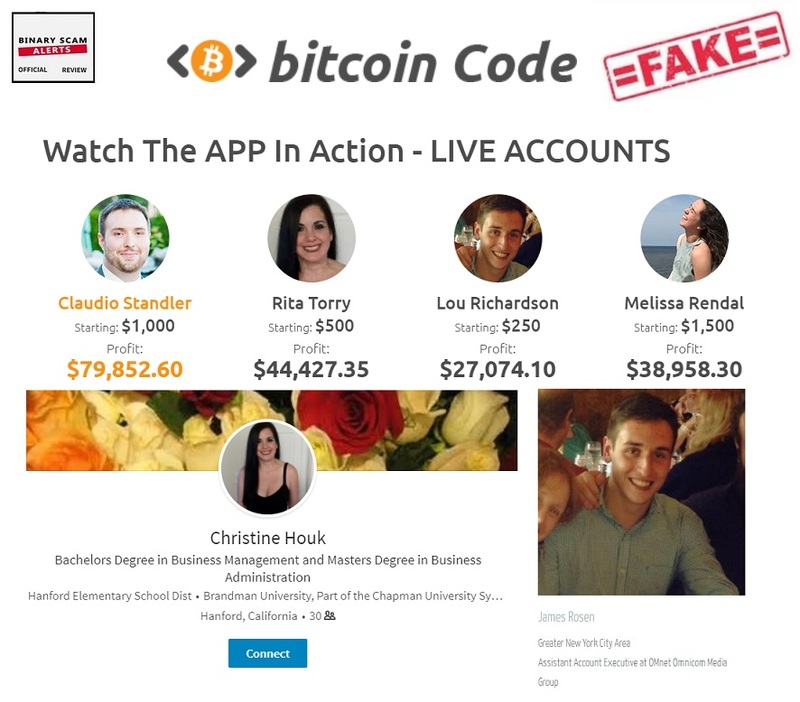 Bitcoin Code and Steve McKay is a fraud software we blacklisted in our review. The only people making money here are the brokers and promoters of this filthy scheme, and you will be the one paying their paycheck. Don’t be tempted by the seemingly appealing or legit nature of this software as not all that glitters is gold. You should be aware of how much you stand to lose if you decide to take a risk and “test the waters”. Don’t be the next victim of this atrocious get rich-quick scheme, and never click on any spammy links or pop up messages. If you have any questions or need further clarifications in regard to this system, please make sure to contact us via our Facebook Page and YouTube Channel.